Bridal showers and Easter time just seem to have so much in common! Flowers in bloom, soft pastel colors everywhere, and sweet spring-inspired gifts for all. But if you feel that an Easter-themed celebration may end up too cutesy and kiddie-oriented for your taste, there’s no need to worry. We offer up an alternative party decorating approach that lets you go chic and stylish at your bridal shower, while still keeping a fresh, springtime garden look! A pink-ivory-yellow palette definitely says spring! So do all the floral decorations and the porcelain keepsake eggs given as Easter-themed party favors. Select a lovely flower-inspired color palette featuring a range of pinks paired with ivory, and highlighted with a touch of yellow. Lay out a solid-colored table cloth in deep pink to provide an appealing backdrop for the feminine and frilly table decor. 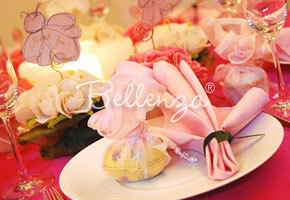 Use pure white plates as a crisp contrast, softened by fabric napkins and favor wraps in the sweetest pastel pink. Peering through the sheer packaging, have an Easter egg-shaped keepsake box for each guest. 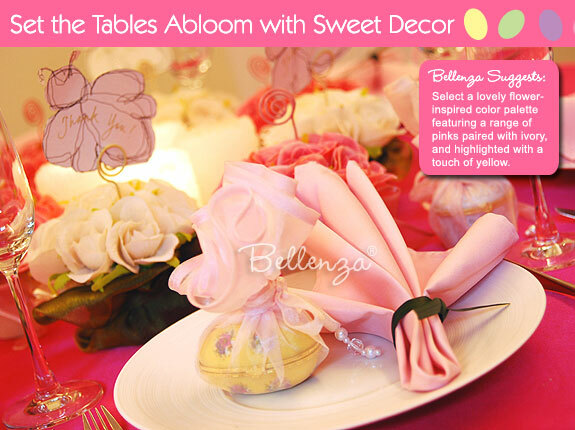 And tie these all together with a grouping of pink and ivory rose arrangements as a delightful centerpiece! Sweet rose flowerpots pair up with whimsical bee-shaped cards to serve either as guest favors or as place card holders, while fancily folded napkins add to the chic look. Nothing says spring quite like flowers! And fresh blooms, of course, would be ideal. But if this is beyond the party budget, faux flowers as pretty as these potted fabric roses are a wonderful alternative as your table centerpiece, guest favors, or place card holders. Cover the little pots in olive-colored organza in keeping with the spring garden look. Tie the wrap in place with its matching ribbon ties that add a pretty look to the pots. To create a lovely centerpiece, simply group these mini bouquets together on your party table. To give these bouquets as bridal shower favors, prepare whimsical buzzing bee cutouts (it is spring after all!) to serve as thank-you tags. To use them as place card holders, write a guest’s name on each bee card and position an arrangement at each place setting. More spring garden touches can come through other table elements. Fold the table napkins creatively in the shape of a fan, with a leaf strip as a natural napkin ring. 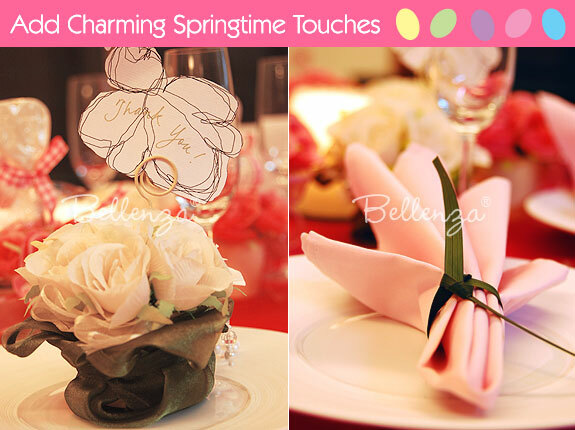 The same napkins could also be folded into an elegant tulip shape and placed in each guest’s water goblet or wine glass. Amidst the rose flowerpots at mid-table, cast a soft glow with elegant candlelight. Present a robin’s egg nestled on a small bird’s nest (these are usually found in crafts stores right before Easter), and use this as a unique place card holder! Check out this site for how to create it. Scatter decorative Easter treats on each plate or serve them in little candy dishes. Think Cadbury® mini candy eggs, Butterfinger foil-wrapped eggs, or M&Ms® in special Easter pastels or in speckled egg shapes! Bake up some treats that can also serve as decorative accents like bunny-topped cupcakes, cake pops with pastel sprinkles, or oval cookies frosted like Easter eggs. 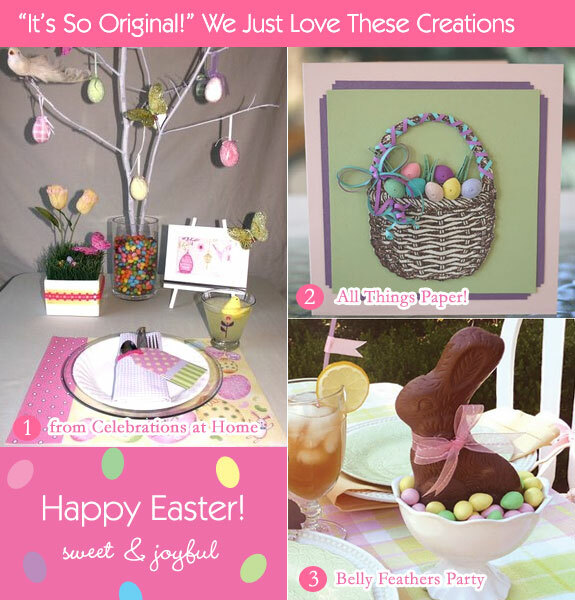 We’re thrilled to share with you three more fun Easter decorating ideas that we discovered from some of our favorite blogs. We’re sure you’ll be as inspired by them as we were! 1) The ever-creative Chris Nease of Celebrations at Home, for instance, came up with this adorable Easter party table setting. You could readily use her “mini manzanita tree” decorated with eggs as your bridal shower centerpiece. In place of jelly beans, you could fill the vase with pinkish crystals and have yellow glittery butterflies perched on the branches. 2) Then, there’s this amazing quilled artwork of a woven basket filled with colorful Easter eggs, handmade by Ann Martin of All Things Paper! The detail work is just so meticulously done. Something like this would make a delightful welcome signage to greet your shower guests! 3) And who wouldn’t love to be greeted at the party table by an all-chocolate Easter bunny? Betsy Pruitt of Belly Feathers Party shows how to display the little fella so cutely surrounded by Reese’s Pieces Easter Eggs in sweet pastels and wearing a pink bow to match! This can be displayed as your main centerpiece settled on some faux grass with decorated eggs scattered about. Next Craft a Wedding Wish Tree Perfect for Spring! Love the pink and yellow together! Those bee cards are super-cute! I love your inspiration pictures! That quilled card is NUTS! We’re doing bunny-folded napkins for our bunny-themed wedding. That might work here, too if a super-eastery look is what you’re going for! Thanks for your sweet comments! Yes, isn’t that quilled Easter basket amazing? How do you do bunny-folded napkins? Sounds intriguing. Fun ideas, great color palette!! Thanks! We love seeing your fresh ideas for color palettes, too! So cute! I love the way you used the grass pieces as napkin rings! I love the other ideas too, like Celebration at Home’s tree! Glad you like it, Kori! Have been enjoying your blog posts for some time now, too!